Size of paper needed to make the project: 12" x 12"
Perfect to let someone know you love them! Cut out a 10 X 7-inch piece of paper from the Peri and Peach Stack. Score at 5 inches and fold in half. 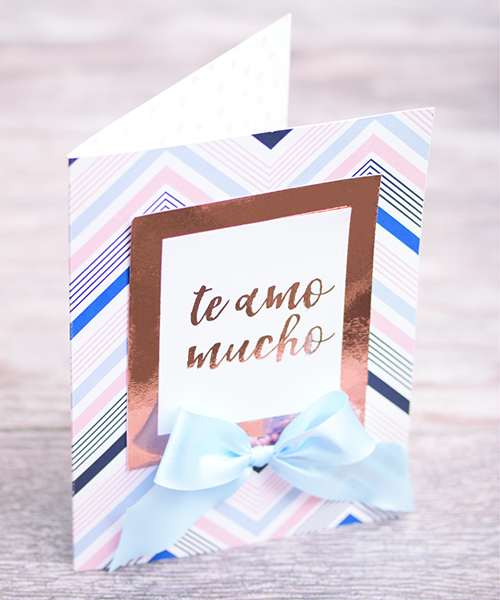 Cut out the “te amo mucho” tag from the tag page. Mat the tag onto a coordinating colored rectangle, making sure to leave a ½ inch border and adhere to the card. Tie a bow with the ribbon of your choice and hot glue to the card, below the sentiment. This card is awesome to let someone special know you love them and it's adorable!